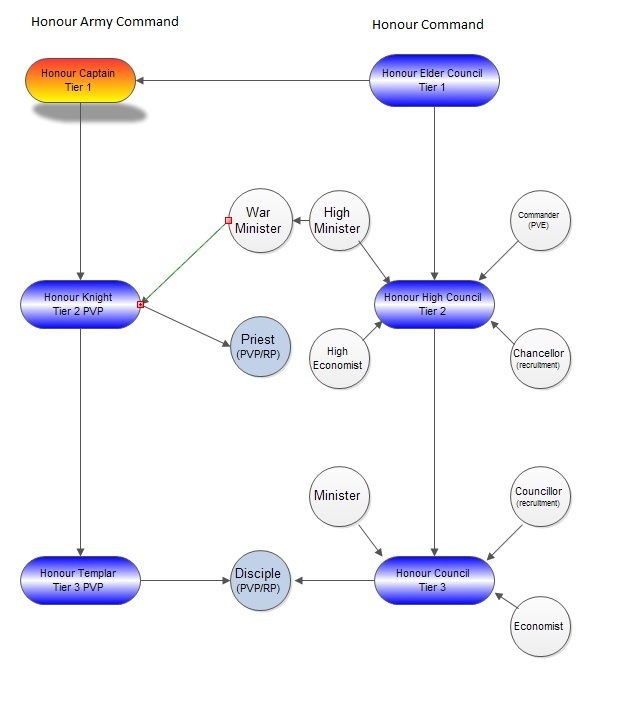 Honour structure is split into a 6 tier Roleplay style structure. This is to aid members of Honour and the outside, understand the Hierarchy of Honour. All management members of the Elder Council (Tier 1) and Honour Council (Tier 2/3) are available on our website. Elder council members are tasked with leading Honour. To join Tier 1, all Elder members and the guilds ruler must be in agreement with a hopeful’s application after a 4/6 month guild membership. Elder council membership grants you guild leader status. Tasked with building and maintaining the core principals and goals of Honour accross the differing gaming platforms. The Elder council positions are specific to the members role in guild. For specified roles see Honour datapad, as each role is specific to member and game platform. Those chosen to go onto an elder position are given secret trials, which usually the candidate is unaware they are on. Elder positions are not given to those who ask for one. All Elders promote and monitor guild discipline together. Overlord: Guild leader of a certain game platform, with responsibility to guild admin and overview/discipline. Field Marshall: Absolute PVE lead - charged with making sure Honour has progress, gearing, training and new council pve leads are discovered and trained. Will be active lead on the high end raids. Oppressor: Total control of recruitment for honour, responsible for honours survival, training and integration of new council members into the rank system, along with discovery of new high council leads. Consul: This is for all afk/semi casual/retired Elders who have served honour with utmost dedication and now are in a stage in life where they are unable to actively lead content. Can still amdinister guild functions if required and will aid with guild discipline. Captain: The Coverted Captain role. lead of Honours grand army. charged with training honour knights and Templars to lead in pvp. The Captain has the ability to over rule all the guilds schedules if deemed absolutely necessary. On an Army roll call all Honour members online and offline that have seen the call are required to attend. Army roll calls are compulsory for all members. Vanguard: Is chief lead with deployment of Honour forces into new environments, games and develoments/updates for website and guild admin. Honour is run day to day by those Honourians in the Honour Council. All members of the Honour council are given access to the council forums and access to the multi chat program outside of respective games. They have a voice on the direction of the guild and are expected and hoped to attend management meetings (via teamspeak) and express concerns, ideas and plans in game and via the council forums. Each council member has the ability to recruit and to put forward an Honourian for promotion. General time frame for application / recommendation in to the Council is 1 - 2 months membership. Once on the council of Honour, always on the council of honour. A council members rank will follow them accross the different Game platforms Honour enjoys. The role of an Honour High Minister is a generalised role which involves, recruitment, guidance for members, helping raid leaders, helping invest in guild members with time, knowledge and dedication. An Honour Minister respects the fact the guild must invest time into its Members. The Minister like the chancellor will take an active role with invest in honours members and helping the elder council with any active honour loyalty programme. High Ministers are often called on to monitor disputes, guild resources, guild leadership and implement new guild content. The High Minister role is the Highest (tier 2) High council role achievable and often will result in attaining Guild leader even with Elder council present. Top of Honours army command (before elder Captain rank). The war minister is a political powerhouse charged with leading the army of Honour in the absence of a ruling Captain. A war minister must pomote army roll calls (wpvp), push honours battle colours (blue and white) along with general guild duties; recruitment and aiding leads in PVE if required to do so. Must also push the lower army command ranks (knight and templar) to keep them rallied, identify new pvp leads and coach new potential leads through their tier 4 training period. The war minister must have served as an Honour knight for a minimum of 3 continuous months before applying for war minister consideration. Where as a high minister can become a guild leader as [T2], a war minister can become head of Honours army. An Honour commanders main focus is of running pve, operations and gearing runs for all guild members. Learning the methods needed to progress the guild in PVE content and running operations to not only succeed, progress and gear but to also train all Honourians their individual roles as tank/dps/healer. The Honour Knight leads from the front, inspires the army and rallies the troops. An Honour knight never runs from a fight and should have the qualities that boost morale and confidence during fights. 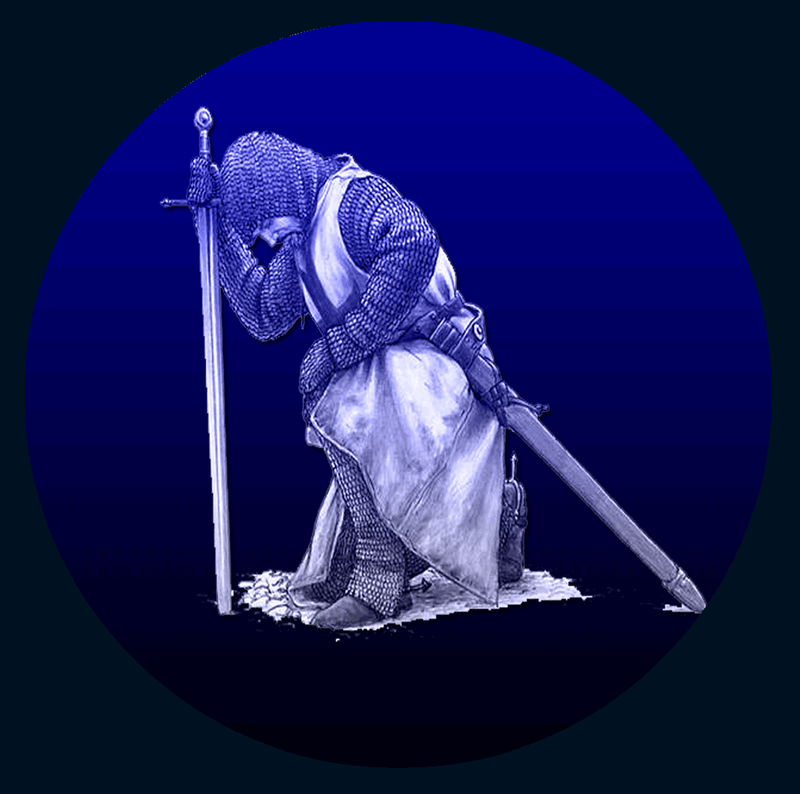 An Honour knight lives, breathes and sleeps in their Colours (blue and white). The Honour knight must have a deep understanding of systems and gears to help train and push Honourians to improve their ability to pvp. They must understand rotations either generally or in their specific "class/specialisation". A knight leads large army raids, either arena style or world pvp. They will also specialise in promoting and leading higher end arena style group pvp and will assemble a capable team in order to compete on their server. Knights should identify Honourians capable of joining the templar rank and create a buddy buddy system with their chosen templar apprentice. Knights are chosen by a war minister/elder council or Captain from existing [T3] Templars who have served a minimum 3 month continuous service. An Honour Knight can also be put foward by Honourians as a recommendation for the elder council captain / war minister, from current Templars who inspire them to pvp or who have inspired a surge of morale boosting in Honours pvp activities. Honour economists are a team of honour artisans, crafters, vendors all tasked with pushing the commerce aspect of Honour. The guild must promote its goals, one of them to be self sufficient. This involves accumulating wealth, resources and commercial success. It also involves investment of resources into the guild in the form of items that may aid the guild members. The Honour chancellor is there to help the elder council find new blood for guild members, increase recruitment traffic, update councillors on any recruitment changes and help maintain guild progression and hamrony as a mediator (if required). They need to help integrate new guild members with links to honours information outlets (forum, facebook, teamspeak, twitter) and guidance on rules, command structure, and education on the goals and activities within Honour. The Chancellor is also there to help with guild integration and can be set as an advisory role. Recon Ministers aid with discovering future possible Honour deployments into new games. New horizons are charted and documented using our spotlight forum along with capturing beta footage, establishing an honour community and testing in game systems for rank structure, recruitment, pvp and pve leading and helping to prepare the guild. Many Recon ministers will be tasked with live broadcasting on Honour TV for all the guild to see new areas Honour is exploring. Honour is run day to day by those Honourians in the Honour Council and Honour High Council. All members of the Honour council are given access to the council forums and access to the multi chat program outside of respective games. They have a voice on the direction of the guild and are expected and hoped to attend management meetings (via teamspeak) and express concerns, ideas and plans in game and via the council forums. Each council member has the ability to recruit and to put forward an Honourian for promotion. General time frame for application / recommendation in to the Council is 2 weeks membership. Once on the council of Honour, always on the council of honour. A council members rank will follow them across the different Game platforms Honour enjoys. The role of an Honour minister is a generalised role which involves, recruitment, guidance for members, helping raid leaders, helping invest in guild members with time, knowledge and dedication. An Honour Minister respects the fact the guild must invest time into its Members. Honour ministers are typically chosen by tier 2 Commanders and put forward to the Elder council as a promotion prospect. The Templar must lead with enthusiasm, pushing small groupings of Honourians in specialised arena environments and on occassion helping lead world pvp situations. The Honour templar in world pvp roll calls could specialise in certain roles, from scouts and infiltration to munition/quarter master roles. When in battle the Honour templar must wear their colours and push those in the army to wear theirs to. The Honour Recruiter is there to help the elder council find new blood for guild members. They need to help integrate new guild members with links to honours information outlets (forum, facebook, teamspeak, twitter) and guidance on rules, command structure, and education on the goals and activities within Honour. An Economists role is to help build guild resources for crafting, selling, promote guild wealth and self sufficiency, maintain guild investment in those honourians that prove their loyalty to the guild. The minister will aid Honours research into new potential betas with grouping, PVE, PVP, broadcasting with the deployment team. This rank if for those members who would like a shot at becoming a council member but would like to be trained to try out. It also used by the Elder council/High council as a trial period for anyone looking to go into Tier 3 Honour council. To qualify for an apprenticeship, members must of been in Honour 2 weeks and shown a lot of commitment. Honour members are expected to follow the rules and guilds core principals. The elder council will direct the guild to help invest in honours members, filtering down throughout the ranks. In times of war every member is expected to lay down everything and rush to the Army roll call prepared to fight to the death. (WPVP) The Soldier program is game specific, with Those Honourians wishing to take a Soldier title as a predominantly PVP active member. The Soldier title is often achievable through request and taking part in game specific trials/training. All above ranks once earned are kept throughout the years and in all game ventures. Honour council ranks: Elder, High Council, Council have specialisations. Eg: Tier 2 High Council: Knight. Here Knight is the specialisation for PVP lead. In the event a council member goes afk or casual this specialisation will be dropped, but the council rank will remain, until they are able, willing and up to date with any guild changes, to take up their specialisation once again. This is to ensure that during their time of afk,causal game play, those that have stepped up into the same rank are allowed and permitted to lead actively without confusion. After 3 months of inactivity/inactive lead ranks will be dropped and the consul rank will be applied, as a holding rank until the council member is willing to step back up to their responsibilities. Retired Council member who is currently without Specialisation roles and therefore not an Active lead. The Captains crown. Once a Captain, the bearer will always be a captain even on retirement or afk. The Captain rank is the highest Honour rank available and only those willing to lead honour in its true end game goal as a fully geared and battle preped Grand Army will have the right to wear the Captain title.